The company behind the famous checkerboard symbol, Purina Mills, was founded by William H. Danforth in 1894. The Purina Company (originally called the Robinson-Danforth Commission Company) was the result of a partnership which was formed to produce animal feed, and operate a retail feed store. Purina commissioned numerous products which were given to salesmen, customers and owners of these feed companies, in return for new or enlarged accounts. This was part of the massive advertising technique to develop wholesale and retail accounts from feed stores, feed lots, farms and dairies. 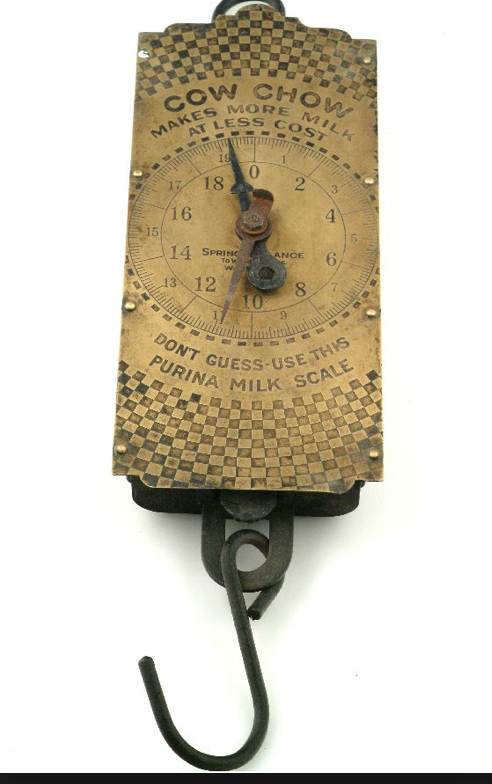 Among the many products produced as incentives were: brass scales for weighing milk, baby chickens, rings, clothespin bags, posters and signs, brass animals, fine art animal paintings, ties, and well-made pocketknives with the famous Purina name and red and white checkerboard overlaid with clear celluloid on the sides of the handles. I have two of these scales, this one is in the best condition and I'm selling the other one on E-Bay. This one hangs on our sunroom wall with quite a few other steelyard and spring balance scales. How much did those cow chow scales sell for?